If you think small animals are cute, get ready to fall in love! After all, what is cuter than a baby monkey? A Pigmy Marmoset is the smallest of all baby monkeys and adorable to boot. His curiosity can be fun to observe, but may cause trouble for anyone hoping to keep him for a pet. The Pigmy Marmoset makes its home in the Upper Amazon Basin. He may be an inhabitant of Columbia, Peru, Ecuador, Bolivia or western Brazil. Wherever he lives, there will be one half an acre of rainforest near a river or floodplain that he calls home. Territories may be marked with urine and an intruder may be warned with a bird-like call. So tiny that you could easily hold it in your hand, Pigmy Marmosets are the world’s smallest monkeys. Seven to twelve inches tall and weighing a mere quarter to half pound, the wee monkey has a tail that may be longer than he is tall. The hairs around his head stand out to form a mane. An observer may wonder at the tiny monkeys antics that look as though he’s gouging a hole in a tree. In fact, that is exactly what he’s trying to do. His long incisor teeth and small canine teeth are perfect for the job. 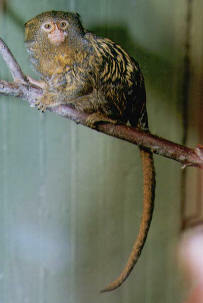 A large portion of the Pigmy Marmosets diet is tree sap. These omnivorous creatures eat other things as well, including fruits, vegetation, small reptiles and insects. Only one female in a group of Pigmy Marmosets will breed. After nearly five months she will give birth to wee twin babies who weigh less than one ounce each. Everyone in the family will help care for the newborns. As the babies grow and begin eating food, the family gives its food to the babies first. I can imagine that it would be hard not to spoil such cute and tiny little tykes! Pigmy Marmosets talk among themselves in high-pitched sounds. They use facial expressions to help communicate and spend a lot of time grooming one another. They enjoy “monkeying” around with their family members. The smallness of this monkey doesn’t keep him from chasing intruders from his territory. E-mail info to add your Pygmy Marmoset related website.